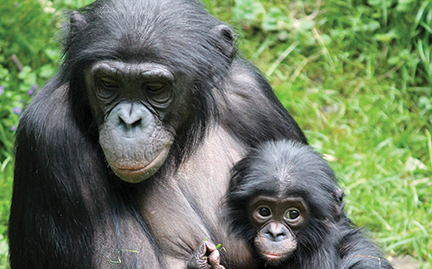 Bonobos inhabit the tropical forests in the Democratic Republic of Congo. Bonobos are highly social animals. Mothers provide most of the care for the young, and teach them how to feed by example rather than actually feeding them. Male bonobos stay with the group that they were born into; a male’s dominance is based upon his mother’s rank. Bonobos are vulnerable to habitat loss and hunting for bush meat.